Pleurodictyum americanum Roemer 1876 is pictured above with a view of its living surface. It is a tabulate coral belonging to the Family Favositidae, thus another type of “honeycomb coral” as we’ve discussed before on this blog. This particular species is notable because it is very common in the Middle Devonian of the northeastern United States (Pandolfi and Burke, 1989). 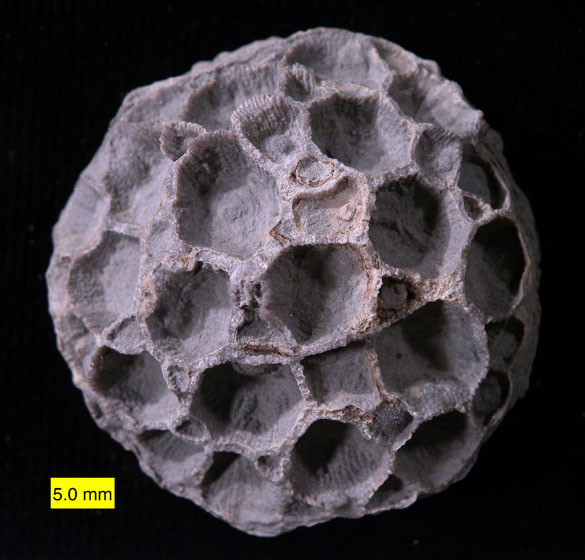 Brian Bade collected this coral, along with hundreds of others, from the Kashong Shale exposed in Livingston County, New York. He generously donated it to the paleontological teaching and research collection at Wooster. What is most interesting about these corals is that they are almost always found with an external mold of a elongate snail shell on the underside at their origin. The snail (more officially called a gastropod) is Palaeozygopleura hamiltoniae (Hall, 1860), and it is best known for its tight relationship with Pleurodictyum americanum. Brett and Cottrell (1982) published a detailed study of P. americanum and its associates, concluding that the coral preferred to encrust P. hamiltoniae shells but only when the snail itself was dead and gone and the shell was occupied by some other organism. 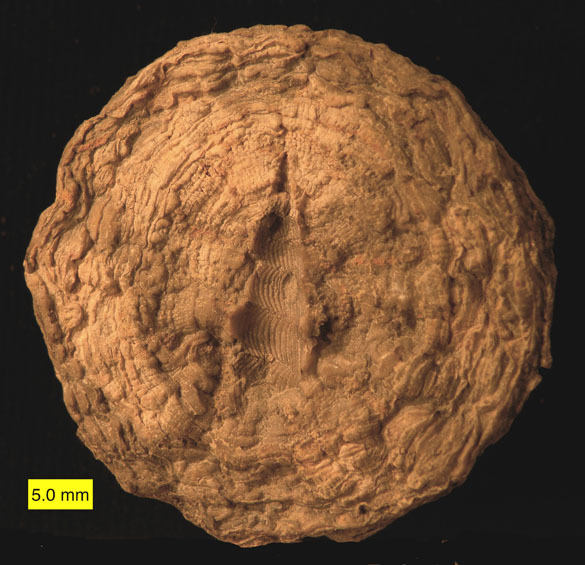 Pleurodictyum americanum underside showing an external mold of the gastropod Palaeozygopleura hamiltoniae. Closer view of Palaeozygopleura hamiltoniae. Pleurodictyum americanum was described by Carl Ferdinand von Roemer in 1876. Roemer was a German geologist (you probably guessed) who lived from 1818 to 1891 — a time interval encompassing some of the greatest changes in the Earth Sciences, from the primacy of Charles Lyell to the general acceptance of Darwinian evolution. Roemer was educated at Göttingen to be a lawyer, but in 1840 abandoned the legal profession for the much more exciting life of a geologist. He quickly obtained one of those new-fangled German PhD degrees in 1842 and set to work. Roemer’s original 1876 drawings of Pleurodictyum americanum. In 1845, Roemer traveled to the USA and studied the geology of Texas and other southern states. That must have been an adventure — the Battle of the Alamo was less than ten years before. It was during the American work that he began to describe Devonian fossils, including our coral species (Roemer, 1876). 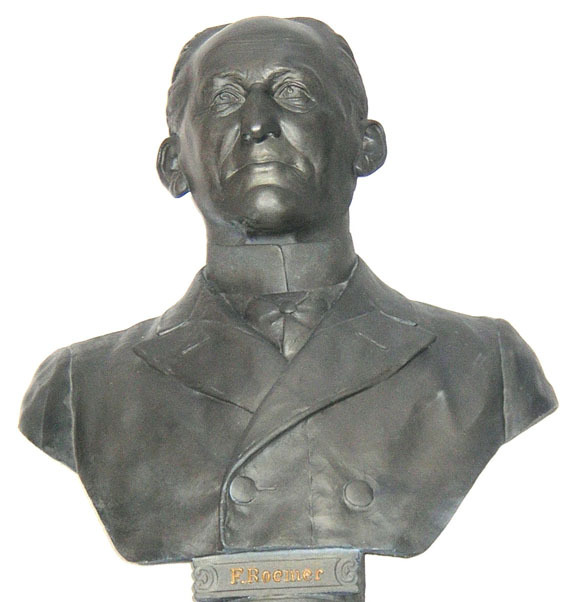 Roemer became a professor of geology, paleontology and mineralogy (another field in which he had significant accomplishments) at the Universty of Breslau, where he ended his career. Carl Ferdinand von Roemer (1818 to 1891) at the University of Breslau (now the University of Wrocław in Poland). Brett, C.E. and Cottrell, J.F. 1982. Substrate specificity in the Devonian tabulate coral Pleurodictyum. Lethaia 15: 247-262. Pandolfi, J.M. and Burke, C.D. 1989. Environmental distribution of colony growth form in the favositid Pleurodictyum americanum. Lethaia 22: 69–84. Roemer, F. von. 1876. Lethaea geognostica: Handbuch der erdgeschichte mit Abbildungen der für die formationen bezeichnendsten Versteinerungen, I. Theil. Lethaea palaeozoica. E. Schweizerbartsche Verlagshandlung (E. Koch), Stuttgart, Germany. Thank you very much for the compliment, Steven! Fossils are always fun, especially, as you say, when we see the ancient relationships. Maybe a Platyceras would be a good future fossil of the week? I found one of these at a Lake Erie beach yesterday. The back has that gastropod impression!